1 Helen Diller Family Comprehensive Cancer Center and Department of Anatomy, University of California at San Francisco, San Francisco, CA 94158–9001, USA. 2 Waksman Institute, Department of Molecular Biology and Biochemistry, and Cancer Institute of New Jersey, Rutgers University, Piscataway, NJ 08854–8020, USA. 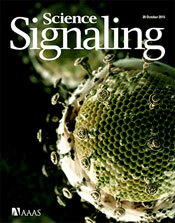 Citation: R. J. Akhurst, R. W. Padgett, Matters of context guide future research in TGFβ superfamily signaling. Sci. Signal. 8, re10 (2015).